MANILA, Philippines (BP) – The stench of rotting dead bodies was overwhelming. “I can’t breathe. It’s burning my eyes,” Makenzie Baker told three Filipino co-workers. With no choice but to continue, they trekked forward over the remains of buildings, animals and bodies in the aftermath of Typhoon Haiyan when most people were leaving the city of Tacloban. A graduate from Union University, Baker went to the Philippines to spend a semester serving through the International Mission Board (IMB) in its Hands On program for involving college students and graduates in missions at a grass-roots level. Baker’s assignment was to serve among the Waray Waray people, an unreached people group on the island of Samar and to follow up on work that student teams and a short-term worker started. For the past few months, Baker, a native of Illinois, traveled up and down the Ulot River, spending the night in different villages, building relationships and studying the Bible with villagers. Though Typhoon Haiyan damaged some homes and schools in the region, people were returning to life as normal. Baker had no idea of the extent of the typhoon’s devastation in other parts of the Philippines. After the Nov. 8 typhoon passed, Baker jumped back into her ministry and traveled to a larger village the next day where a Filipino pastor encouraged them to go to the city of Tacloban which had suffered widespread destruction. Baker said she wasn’t sure about going to Tacloban, a city of about 200,000, not having any idea of the circumstances there. But she decided to proceed, spending four hours on rough, mountainous roads in three different vehicles, punctuated by several flat tires, before reaching their ministry base camp at the town of Can-Avid. IMB missionary Kim Cruse reached Baker by cell phone and tried to prepare her for what she would see and experience in the aftermath of the worst storm to ever hit the Philippines. Baker and her three Filipino ministry partners boarded a bus to Tacloban. At a major bridge, a mob of traumatized people began attacking the bus, demanding that it turn around and take them away from the devastation. Baker had to crawl through a window to get out of the bus. She and her ministry partners took a bicycle taxi across the bridge and then set out on foot – hiking 15 miles in a blazing hot sun. On the trek, Baker said she was worrying whether she’d be able to return to her ministry among the Waray Waray people. Dead bodies littered the road. The smell of decaying flesh was crippling – both physically and emotionally. Baker and her companions had no choice but to continue walking over and around dead bodies, meditating on the verses in Proverbs. She and her companions passed many Filipinos who were just sitting by the side of the road in a daze. Baker realized why they were just sitting after reaching Tacloban. “It is just so overwhelming the amount of destruction there,” she said. All of the landmarks were gone, and Baker and her friends had trouble finding their way through the city. As darkness fell, Baker realized they needed to find shelter. Desperate crowds were stealing from stores and from people passing by. They hiked for another hour and were about to give up on trying to find a local church. “I looked up and there is another American,” Baker said. “My Filipino partners start talking to him and he answers in perfect Cebuano. She then learned that he was Stan Smith, an IMB missionary on the island of Cebu who had traveled for hours, hiking for a long portion of the journey on foot through destroyed villages, to find her and IMB missionaries Carl and Suzie Miller. Smith and Baker subsequently found the Millers in their typhoon-ravaged home in Tacloban. He, Baker and the Millers waited for six hours at the airport to be flown to Manila by U.S. Marines on a C-130. “It was like the things you see on the movies,” Baker said. Throughout the whole ordeal, “God gave us all strength,” she said. “God kept us so safe.” Amazingly, she didn’t have any blisters or cuts from nails from the hours of hiking. • Pray for the ministry that Baker, student teams and Filipino believers have started among the Waray Waray people, that God would bring many Waray Waray to Christ. 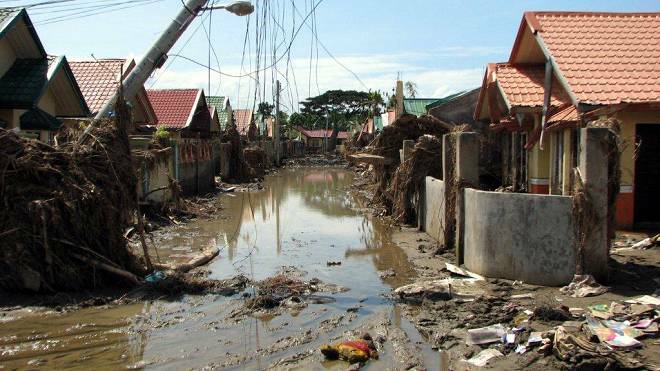 • Pray for the city of Tacloban as its people recover from the worst-ever typhoon in the Philippines.